Gun Training Report #16 Don't Let this Happen To You! Guns Should Not Blow Up! Prior to becoming the second man in the world to successfully complete the Four Weapons Combat Master test in 1993 and subsequently opening Front Sight Firearms Training Institute in 1996, I traveled all over the country, taking firearms training courses from all the big name instructors and schools. It was in those courses, as a student, that I saw what needed to be improved in the firearms training industry and then set out to create the finest gun training school in the world. When I opened Front Sight in April of 1996 I was a relative unknown in the industry, but the improvements I created in the way students are treated and taught plus the revolutionary manner in which I "Exchange in Abundance" with my students drove Front Sight to the top of the industry in record time. In fact, I have DOUBLED Front Sight each and every year for 11 straight years and am on track to double again in the next twelve months as we continue to positively change the image of gun ownership in our lifetimes with each and every student who attends our courses. Even though Front Sight's growth has been explosive, the guns that we train with do not explode. This occurs when the barrel becomes obstructed due to the previous round being a dud or squib (no powder in the cartridge) so that the bullet does not have enough force from the primer charge to exit the barrel and is followed by a full power round that sends the bullet down the obstructed barrel. The results are exciting, but you don’t want to be holding the gun or next to the gun when it blows apart. This can also occur when a round has too much powder charge which creates excessive chamber pressure leading to catastrophic failure of the locking mechanism. This can also occur when soft lead bullets are used which create a build up of lead on the breech face over time, which allows the slide to chamber the round and the trigger to be pressed, but not fully lock the action into place. When the weapon fires, the chamber pressure is not contained and the action explodes. 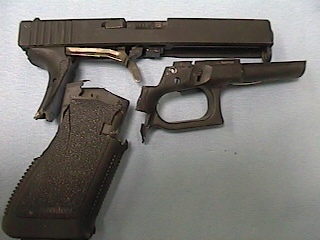 Here is a picture of what that looks like in a Glock pistol. NOTE: This did not happen at Front Sight and to my knowledge we have never had a gun blow up after tens of millions of rounds fired by tens of thousands of students. There is a reason why it has not happened at Front Sight. After you take a look at this Glock, I will share with you the common denominator in handguns blowing up and tell you the reason why you need not worry about that happening at Front Sight. 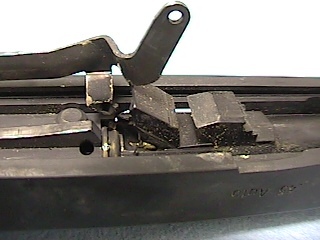 The photos below illustrate a catastrophic failure of a Glock 21. 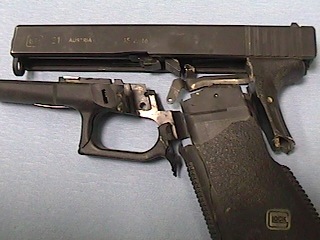 Again, this incident did not happen at Front Sight Firearms Training Institute, but is one of many such incidents elsewhere that are the reason why Front Sight has always required students to use factory new ammunition.The shooter of this pistol was using reloaded, full metal jacket ammunition. To the best of our understanding of the incident, the cartridge case was not sized properly, preventing the action from locking up fully, but allowing the action close enough to fire the weapon. The result was an open breech detonation of the cartridge. The photos speak for themselves. The shooter received severely bruised hands, with minor to moderate lacerations to his hands and face. We have received reports of similar incidents with the Glock 21 and I have personally witnessed a less dramatic incident with a Glock 21-magazine blown out of the weapon and shooter's hand bruised. In all incidents reported, reloads were used. Click on any of the three images for a larger view. The common denominator in handguns (or any other gun) blowing up is the use of reloaded ammunition, once-fired-brass ammunition and soft lead bullets. For this reason, Front Sight only allows FACTORY NEW, COPPER-JACKETED AMMUNITION from reputable companies that sell on the retail markets. I know I will hear from the hand reloaders on this issue who claim that their meticulous hand loading of ammunition is far superior to anything the factories can produce. My answer to them is this: You are probably right. But what about the hand re-loader on the firing line next to you? Can you vouch for him, too? We can’t. So our policy for the protection of you, him, and the shooter next to him is factory new, copper jacketed ammunition from a reputable company who sells in the retail market. Our track record of NO GUNS BLOWING UP even with tens of thousands of students shooting millions and millions of rounds -- especially compared to the frequency of guns blowing up I witnessed as a student -- proves beyond a shadow of a doubt that our ammunition policy is right on target. Besides, the slight extra cost incurred in buying factory new ammunition is the cheapest insurance you will have against a catastrophic failure of your own gun or taking shrapnel from the gun next to you. Everything we do and say has your best interest in mind. We would not be the leader of this industry if that were not so. In my next report, which you should receive in the next few days, I am going to dispel some myths about handgun ammunition and share the information you need to know when selecting the handgun and ammunition you carry to protect your life on the street.